Some of the rest of the book worked well for me as well. The surreal conversations, packed with popular culture quotes (some of which I got) were fascinating. However, I'm not a great fan of disaster novels - I loved Wyndham as a teenager, but rather grew out of the callousness of the whole concept; the action that takes place throughout Bête is a disaster novel scenario, even if, this being Roberts, it is given all sorts of unexpected twists. So it's my fault, rather than the book's that I was fascinated by that opening scenario and the main character (especially as a friend is an ex-organic dairy farmer), but for me, it would have made a brilliant short story or novella, rather than requiring the rest of the book. 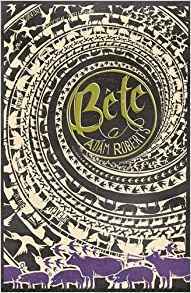 So Bête is not one of my favourite Roberts novels, even though the bits that really got to me comprised some of the best SF writing I've ever seen. Let's be clear, every Roberts novel is worth far more than most post 60s SF - and I strongly encourage anyone who likes science fiction, or the philosophy of AI to read this book. It simply wasn't in my top five.